Six months on from the launch of W177 Mercedes-Benz A-Class hatchback in Malaysia, it’s finally time for the V177 A-Class Sedan to make its debut. The compact four-door will come in the same variants and similar levels of kit as its sibling, giving buyers greater choice in the fledgling premium small car sector. With the separate boot comes a slight price premium – the A 200 Progressive Line retails at RM229,888, RM2,000 more expensive than the equivalent hatch, while the A 250 AMG Line gets a RM4,000 increase over the five-door version, priced at RM267,888. Both prices are on-the-road without insurance, inclusive of a four-year, unlimited-mileage warranty. The sedan tacks on an additional 130 mm to the rear end plus a six millimetre increase in height, with measurements totting up to 4,549 mm long, 1,796 mm wide and 1,446 mm wide (the wheelbase remains the same, at 2,729 mm). 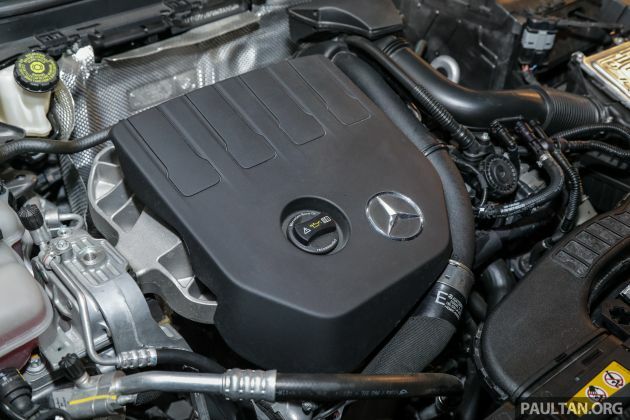 Mercedes claims that the sedan offers class-leading rear headroom and above-average shoulder and elbow room, while its 420 litre boot is 50 litres more than its five-door sibling. Design-wise, the sedan retains the hatch’s low shark nose front end, featuring tapered headlights and a trapezoidal grille with a dinner plate-sized three-pointed star. Also retained is the strong shoulder line, simple upswept character line lower down and a sweeping glasshouse, while the rear gets angular two-piece tail lights that decorate the pert rump, emphasising the car’s width. Both models come with LED High Performance headlights (not the top-spec Multibeam units) with auto high beam, along with visible twin exhaust exits and 18-inch five-spoke alloy wheels. The AMG Line package on the A 250 adds aggressive bumpers, side skirts, larger cross-drilled front brake discs and AMG-badged alloys. 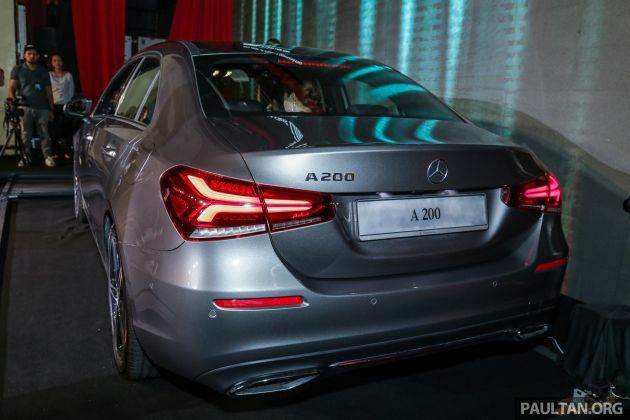 The A 200 comes with run-flat tyres, while the A 250 rides on standard tyres and adds a tyre repair kit. The twin 10.25-inch instrument and infotainment displays utilise the new Mercedes-Benz User Experience (MBUX) interface. 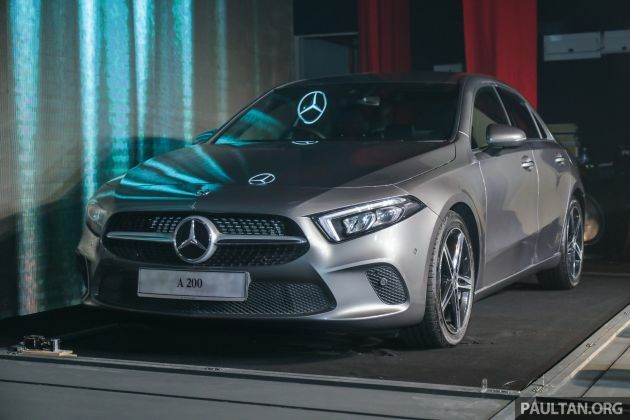 The main highlight is a voice control system with natural speech recognition – using the phrase “Hey Mercedes,” users can operate key features such as the air-conditioning and navigation, and the system will also learn their preferences over time using artificial intelligence. For interior accoutrements, the A 200 comes with black open pore linden wood trim and Artico faux leather upholstery, while the A 250 gains heated sports seats with integrated headrests, a Nappa leather-wrapped flat-bottomed steering wheel, brushed aluminium decor and Artico and Dinamica microfibre upholstery. Standard equipment is identical to the hatch and includes keyless entry, push button start, power-adjustable seats with memory and four-way lumbar adjustment, cruise control, single-zone automatic climate control (no rear vents), auto-dimming and auto-folding mirrors, illuminated door sill plates, hard disk-based navigation and Apple CarPlay and Android Auto functionality. Under the bonnet, the A 200 now uses a smaller 1.33 litre M282 four-cylinder turbo engine, developed in conjunction with Renault. It makes 163 hp at 5,500 rpm and 250 Nm of torque from 1,620 to 4,000 rpm, and when paired to a new Getrag seven-speed wet dual clutch transmission, it results in a zero-to-100 km/h time of 8.1 seconds, a top speed of 230 km/h and a combined fuel consumption figure of 5.4 litres per 100 km. The A 250 gets a revised M260 version of existing 2.0 litre mill, churning out 224 hp at 5,500 rpm and 350 Nm between 1,800 to 4,000 rpm. It hits 100 km/h in 6.3 seconds, reaches a top speed of 250 km/h and delivers fuel consumption rated at 6.3 litres per 100 km. This one gets a revised version of Mercedes’ own DCT, which is also a wet clutch unit. Both models ride on comfort suspension, with passive dampers and a 15 mm lower ride height than standard. The A 250 is the only one to come with multilink rear suspension, whereas the A 200 receives a new, simpler torsion beam setup. Safety-wise, all models get seven airbags, Active Brake Assist (autonomous emergency braking), a tyre pressure monitoring system and Active Parking Assist with a reverse camera. Browse full specifications and equipment on CarBase.my. A250 at RM270k is ridiculously high. MBM must start reducing their prices. Don’t be greedy. A250 is considred entry level Mercedes in most countries in the world. Parts also cost so expensive because MBM want to maximize margins. Just like the Mercedes Hybrid battery at RM130k, then overnight, after netizens protested, became RM55k. (Like) 2019 Mazda3 2.0 SkyActiv-X RM120k. Yup. 10 months so fast songlap so much. You are right. This is because it is the same 1.6 million lazy Government servants as 5 years ago and they like dedak so much. I see. So meaning it wasn’t the 1.6 million Government servants which is the problem but the politicians in the cabinet and now we got the worse cabinet that is reaping corrupt profits in record time. We have voted in a monster! If this is true, then it just shown cabinet weakness where they cant even control their own staff which brings to another question. Is this the implication of hiring ppl with lack of credibility i.e. fake cert issue? Most of whom (also speculation) wouldn’t be too affected with paying ~RM250k for an entry level Mercedes. MBM knows this. Also, Mercedes prices past 10 years have gone down in price. Young corporate execs earning 8k/month qualified to get 7yr loan for range topper A250. The era of RM180k for the A-Class has passed us so swiftly. With the new price and looks, these might ended up being a rare sight on the road. Should have skipped this and go on straight to the CLA and C-Class. One can only imagine how expensive the new CLA will be. CLA200 @ 250k and CLA250 @ 300k for sure. Price all up but no value given in return. MBM still stuck with 4 years warranty while Audi and BMW Malaysia now offer 5 years warranty. All the best in selling these models. Not just Mesidis but even Audi and BMW went up in prices significantly. Err local launch but no local car pics? All just the global LHD car pics only. I am saddings. Don’t compare Mercedes to P1. This is why P1 never improves themselves. The arrival of Merc marketing genius, Mark Raine has been a revelation to Malaysia premium car segment. Elevating Merc Benz right to the top, a segment which was dominated by grey Recond imports not long ago. Sadly the amazing guy will be leaving Malaysia soon. Every 5 years they change VP ? When was his first appointment date? When I check history 2014 when launch W205 CBU C class was different person. So assume 2015 M.Raine took position means by 2020 he would be ending 5 year term. So gonna be sad to see his departure ……. he revolutionise the whole image of MB to Malaysia . And not to forget his exceptional marketing strategies for launches , events and so on. The 3 series competes with C class, and the A series goes against the 1 series. Get your facts right. Why buy Mercedes? Better buy Nissan. Nissan quality far surpasses Mercedes. I can vouch for this because I own both Mercedes and Nissan. My Mercedes always breakdown and maintenance very high. My Nissan never breakdown. Better wait for G20 BMW 318i selling at RM218k. Don’t worry when CKD 330i kicks in it will be cheaper but for the A Class….sorry no plans for CKD so that is the final price. Better off with the CKD C Class. Why not. Camly already 200k. So conti cars also must upgrade price. Else no one will buy. And at that price, they won’t even throw in rear aircond vents! Instead, they leave that big cheap-looking gaping hole there. 220k for a torsion beam. God you’ve got to love the badge a hell lot to plonk that money down. The multi link suspension on the A250 isn’t all that better either. You need wider tyres to compensate the skidding you get when you enter the corner too. power send to front wheels or rear wheels ? You knew you have made it in the society. Get a mercedes Benz and you have make it in the society by joining the club to become a Taxi and Limousine Driver. A lot of people buying other Premium Brands that cost more ,higher specs and better looking than any Mercedes Benz dare not even say they have made it in the society. Those dash screen looks like yesteryear’s cheap tab lcd’s. C200 vs A200. I think u know who will win. As for the A250 sedan, what’s with the heated seats?? Can MBM delete that option and opt for a power boot or something like lane departure or blind spot monitor? Civic’s multi link is no much different or better then a torsion beam!! Both are budget (cheap) suspension setup.. Seems like you know a lot about suspensions, how about you share which suspension set is best. Civic runs on a CVT, after 100km/h takes ages to top.. Dual clutch system still wins if u wan talk about acceleration !! Go play with ur civic’s virtual gears!! Wan brag about civic’s multilink !! Honda installed cheap dampers on it, after 2+years of use start leaking..
Now everyone knows Mercedes is way too over very high price and nothing and paying more for the batch + accessories only!!! Salesperson some more action like hell!! 280k for an a class? Is this a joke? Whoever pays the price is an idiot. Bo bian… Most of the cost has gone to the “big iPad screen” dashboard, Siri like voice command..
Is this CKD or CBU? Mercedes build this spice for “WAGs” Market. Uses getrag gear box, just like Proton manual cars, saga, iriz. Getrag also supplies transmissions to Ferrari and BMW’s M cars. What’s your point? If you cannot afford to buy expensive german cars. Buy a manual Saga or Iriz, and you get getrag german transmissions? Who say BMW G20 330i OVERPRICE? seven years ago, F30 328I CBU launch price at RM309K, RM20K less than G20 330I . but don’t forget f30 only offer sport/luxury line not msport . A lot of bashing on this new A Class instead of praises. Look, if anyone mentioned about P1 or Nissan or even other Japanese brands then I can say that that person doesn’t know how to appreciate a branded and premium car and should put their comment to somewhere else and not condemning the car. Of course branded car is expensive and what do you expect? Mercedes always being a premium brand or car and yes, they don’t care how you feel about the brand or car and the people that bought the car don’t really bother about the price because of the brand and look. I do owned the new A Class (hatchback) and BMW at the same time. Compare to BMW or even Audi, Mercedes looks premium and worth the price. The new A Class offered the technologies that even a base C Class can’t offer. So the price I think is right on. So if you like it and you can afford, then you buy. It is that simple.If you can’t, then don’t bash the brand and buy something you can afford. But if you are looking for driving pleasure and comfort, then you should go for BMW although their 1 series is a bit old and no longer in stock. If you think the price of A Class is ridiculous, you should see the price of the face-lifted Audi A3, which also a good car by the way. The new A Class is fun to drive and the steering is very light, good for city or town driving and the reason I chose A Class is because the fuel consumption is fantastic. The engine sounds a bit weird but potent. Mercedes always looks premium but if refinement is what you are looking for, then better go for Audi. That’s what I can advise for those who can afford a premium brand. For those comparing Japanese Brands of even P1 or P2, please, you are not comparing apple to apple and please give your humble opinion at the relevant page but not here, unless you have “test-drive” the car. Also, I used to own P1 twice and Japanese Brands. They are good in their own way not I cannot put any single word to compare as I have explained earlier. We do not buy it. Q3 is ugly, A Class ride is horrible , X1 does does not handle as well as XC40 and not as good looking like UX. you are simply uttering rubbish, even we are afford doesn’t mean we will pay for such nonsense. Boss ada banyak kereta, loan sodah bayar ka? Civic 1.5 turbo can cucuk merc A200 and still cheaper. Civic 1 5 T is typical Japanese make. This A class is a European make. Pls compare your cheaper 1.5T elsewhere with other Japanese and Korean makes of your Japanese class .